Anthony's wealthy family wanted him to be a great nobleman, but for the sake of Christ he became a poor Franciscan. Priest. A gifted speaker, he attracted crowds everywhere he went, speaking in multiple tongues; legend says that even the fish loved to listen. Miracle worker. One of the most beloved of saints, his images and statues are found everywhere - though none of them portray him as a heavy-set man, which some reports claim he was. Proclaimed a Doctor of the Church on 16 January 1946. One source of the well-known patronage for the recovery of lost objects comes from a legend that, long after Anthony's death, his old prayer book was kept as a treasured relic, and one day it disappeared. People prayed for help in finding the lost item, a novice found it and returned it; he later admitted that he had "borrowed" the book and returned it after receiving a vision of an angry Anthony. Lifelong lay woman in the diocese of Lomza, Poland. She had little education; she may have been able to read a little, but she could not write. Raised in the Orthodox church, she converted to Catholicism at age 17. Married to Ludwik Biernacki, a farmer, at age 20. Mother of six, only two of whom survived infancy, her daughter Leokadia, and her son Stanislaw. Widowed, she moved in with Stanislaw and helped raise her grandchildren, in part by setting an example of personal piety. When the Nazis and Soviets divided Poland between them in World War II, Marianne's town came under German control. When local resistance groups did anything to fight back against occupying forces, the Nazis would have reprisal executions, rounding up random citizens and killing them as a warning to the resistence. On 1 June 1943 the Nazis arrested Marianna's son Stanislaw and his wife Anna, who was pregnant, and put them in the group to be murdered. Marianna pleaded to take the girl's place, and Anna was freed; Marianna asked to take one thing with her - a rosary. The mother and son were briefly imprisoned and then executed. Martyr. Chosen bishop of Assisi, Italy by Pope Fabian in the mid-3rd-century. Martyred with several companions outside of Assisi during the persecutions of emperor Gordian III. Hermit in the Arbusto Valley of the Pyrenees region of France. He spent most of his time in prayer, but would sometimes come down to the villages to preach. Martyred by Moors for preaching Christianity. Lifelong layman in the apostolic vicariate of East Tonkin. Soldier. Worked to help the foreign missionaries. Worked, tortured and died with Saint Nicolas The. Martyr. Anthony heard Saint Norbert of Xanten preach in Nivelles, Belgium c.1120, and was so impressed that he gave away everything to become Saint Norbert‘s 3rd spiritual student. Studied with Blessed Hugh of Fosse and Blessed Evermod of Ratzeburg. One of the first Premonstratensian monks. Canon of the motherhouse in Premontres, Laon, France. Prior of the Ilbenstadt monastery in Wetterau, diocese of Mainz, Germany. Monk as a young man. Well educated in the literature and science of his day, was a Biblical scholar, and studied the writings of the great pastors. Opposed the Eutychian and Monophysite heresies. Patriarch of Alexandria, Egypt in 579, serving for 28 years. 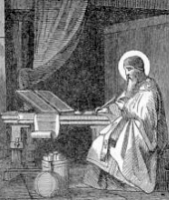 His correspondence with Saint Gregory the Great has survived. Lifelong layman in the apostolic vicariate of East Tonkin (in modern Vietnam). During the persecutions of emperor Minh Mang, Nicolas was ordered to stomp on a cross to show his contempt for Christianity; he refused. Martyr. Joined the Mercedarians in Valladolis, Spain. Studied at the University of Salamanca, Spain. Priest. Vicar of the Mercedarian College in Salamanca in 1600. Travelled to Mexico in 1609 to serve as a preacher, missionary and secretary to Venerable Antonio de Mendoza. Missionary on the isle of Puma, Ecuador. Captured and murdered by heretic Dutch pirates. Martyr. Joined the Premonstratensians at age 20. Canon of the Premonstratensian Steingadan monastery in Weilheim-Schongau, Bavaria, Germany. Priest. Had a great devotion to the Blessed Virgin Mary. When Protestant Swedes invaded Bavaria during the Thirty Years War, Servatius took to the road, preaching in town after town, celebrating the Sacraments, and exhorting people not to abandon Catholicism. 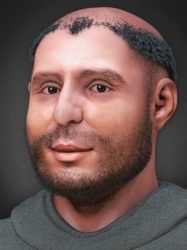 Brother of Saint Bernard of Clairvaux. Soldier. When wounded in combat at the siege of Grancy, Gerard resolved to become a monk. Benedictine Cistercian monk at Citeaux. Worked with Saint Bernard at Clairvaux, and became his closest confidant. Cellarer. Arrested at age 12 for her faith during the persecutions of Diocletian. When she clung to her faith, the magistrate Volusian ordered the child beaten and beheaded. Martyr. Saint Joseph the Hymnographer composed an Office in her honour. Priest, ordained in the late 3rd century. Director of the famous school in Alexandria, Egypt. Bishop of Alexandria in 311. Though he only led his see for a few months, he was known for preaching and writing against Arianism. Bishop of Amiterno (modern San Vittorino, Italy). Murdered by Arian Lombards for asking for mercy for a condemned prisoner. Martyr. A sanctified virgin who was imprisoned and martyred in the persecution of Domitian. Bishop of Vienne, France. Went into exile to Rome, Italy, c.752 due to Frankish persecution. Retired from his see to spend his remaining years as a prayerful monk in the monastery of Saint Mauritius. Member of the royal court in Austrasia. Murdered by the tyrant Ebroin; he has always been honoured as a martyr. Monk. Abbot of Clonmacnoise monastery, County Offaly, Ireland c.574 to c.590. Spiritual student of Saint Brendan. Hermit at Limoges, Aquintaine (in modern France).